Yes, I even bake Shern's food sometimes. So far, this recipe does delight Shern whenever he gets to eat them. 2. Peel, then core, the pear. 3. 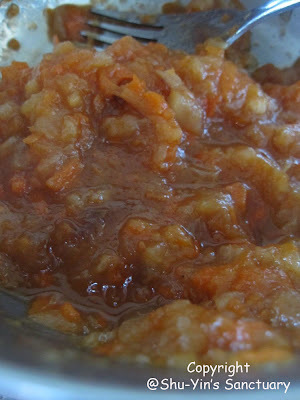 Cut the carrot into strips and the pear into chunks. 4. 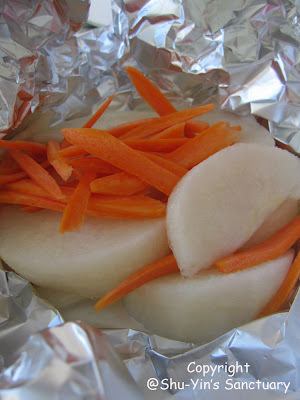 Wrap the prepared carrot and pear in foil and seal, to make a parcel. Poke a few holes on top. 5. Bake at 375 deg F (190 deg C) until tender, which is about half an hour. Mash well or puree. I usually use chinese pear because they are more easily available currently. The sweetness in the pear became caremalized brown and the taste is so good. I love the taste myself. I only need to mash it because the pear slices and carrot strips are tender and soft and I am starting Shern on lumps and chunkier texture. Try it out and see if your baby loves it as much as Shern.